Sleeping in the Metro, a Paris street photo I took some time ago. This gentleman was waiting for his metro, which took a while to come. Not even so sure he didnt miss a couple before he realized what was happening. To me photography is a passion, it’s about capturing moments that and conveying emotions. Aside from HDR which is all about strong emotions (and incidentally why I love it) street photos are another great way of capturing special moments. There are masters of the art, they just know how to be at the right place at the right time and take it. They probably also have the nerve to stand up in front of strangers and that a great photo. I don’t pretend to have any of the above, as to street photos, I am still a bit of a luck photographer. Even though I sometimes go out and tell myself not to return until I have a whole bunch of street shots, only a few of them make it out of my hard-disk. 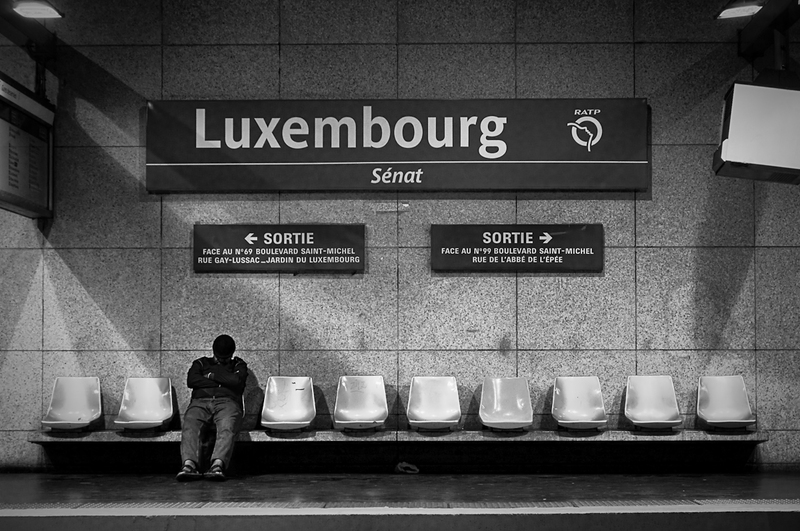 It was taken in Paris subway system at the station called Luxembourg (I guess you figured that out) I took it the same day as I took this photo “Looking back“. Subways are great places for street photo. Especially outside of rush hours (as you’ll have more space) and just sitting on the opposite side with a decent zoom you’ll get lots of great pics. When in Paris look especially for RER stations because people are travelling longer and that tends to show in their behavior. It’s also easier for the non-pro as you’ll have more time to adjust for your shot. 31 Jul	This entry was published on July 31, 2011 at 10:12 pm. It’s filed under black and white, Nikon D300, non-HDR, Paris, People, photography, Street photography and tagged nikon d300, non-HDR, Paris, photography, photos, street photography. Bookmark the permalink. Follow any comments here with the RSS feed for this post. Nice photo and nice article !